Due to the high demand and high quantity of people requesting this type of rental during previous years, we have worked hard to prepare and coordinate this service through the leading website on CAMINO DE SANTIAGO cycle touring. Our rental bicycles are now prepared and set up specially to serve pilgrims pilgrims who, travelling on foot, want to go through the hard and monotonous stages on the plain and wasteland quickly. In normal circumstances this stretch can be made in about 3 or 4 days of pedalling. We will deliver the bicycle at the location you propose us and we will pick it up at any of the HOSTELS, HOTELS or BICYCLE WORKSHOPS affiliated with Bicigrino. You can look up these establishments consulting our guide, which is available to download for free (spanish language only):DOWNLOAD BICIGRINO GUIDE. These bicycles can be booked with a minimum anticipation of 24 hours. The bicycles are ready to be rented in the stretch of Camino de Santiago (French Way) between BURGOS and LEÓN. The bicycles will be delivered to you first thing in the morning on the hotel, hostel or bicycle shop proposed by the customer or coordinated by mutual agreement with Bicigrino. EN CALZADILLA DE LA CUEZA. Plaza de la trasera Mayor, 8, 34309 Calzadilla de la Cueza. ** Some of these establishments may charge you up to 5€ as cloakroom service if you use their facilities as delivery / pick up location without staying overnight. The rental price includes all the services mentioned avobe, even the transport of the bicycle to the location chosen as starting point of the route. The bicycle delivery will be direct to the person renting it, but reservation and payment must be done through BICIGRINO ONLINE SHOP. Our bicycles have been modified and adapted for optimal use of the service offered. They are equipped with ergonomic handles to avoid that your hands go numb, platform pedals that allow to pedal with regular footwear, special rack and container to attach your backpack, etc. And all this in a high-end bicycle with disc brakes and front suspension fully adjusted and ready for your route. Here you can see one of the bicycles for rent. As indicated they are high-end bicycles with disc brakes and thoroughly equipped for the service offered. Rear derailleur SHIMANO DEORE, 9-speed. Semiautomatic pedals (platform on one side to be able to pedal using regular shoes and cleats on the other for cycling shoes). The bicycle rental service at Bicigrino is aimed to facilitate the Camino de Santiago to those who decide to use a bicycle and because they can not use their own bicycle or other reasons decide to opt for renting as a better option. The bicycles for rent have been personally chosen by Bicigrino after the experience gathered after completing the Camino de Santiago for 6 times and with the appropriate criteria to assure the completion of the route. They are high-end bicycles with all the components manufactured by SHIMANO to widely facilitate the resolution of any eventuallity during the route. IT COULD NOT BE EASIER ;). Our original system adapts and combines specially with the rack pre-installed on the bicycles. It can be placed and removed with just one hand and you will be able to carry your backpack or personal belongings without any adaptation. We are aware that you are doing the Camino de Santiago on foot and as such your luggage will be adapted to the way you are doing the Camino. For that reason we adapt to your needs and our bicycles are equipped to carry your specific luggage and facilitate this stretch of the route. 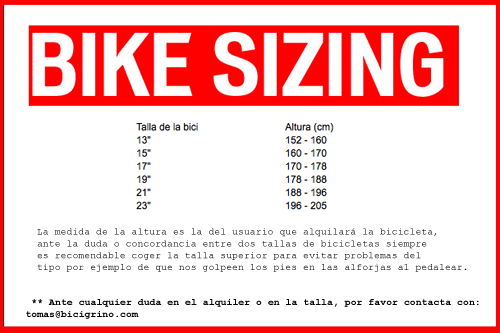 We believe it is interesting that the bicycle is the right size according to your height and although you will use it only for a few days and for a relatively calmed pace it is not essential, it would be nice that the size of the bicycle is as closest as possible to your measurements. If you had to use a size up or down there would not be much problem as the bicycles have a few regulators and different ways of adapting the saddle. The rental price includes the accesories and tools necessary to practice cycling. Special container box for carrying backpacks and luggage. Elastic mesh to hold the luggage. We work in collaboration with JACOTRANS, a company specialized in transportation of backpacks and luggage on the Camino. If you want you can get a special price for this services and travel through the stages carrying just the essential equipment with you. Consult us for special prices and conditions according to your stages. We will arrange the transportation of your luggage. Our contact phone (+34 627 928 213 ) is always connected and ready to guide you and solve any problem during the route. - The rental price includes the transportation of the bicycle to the location of your choice within the stretch of Camino de Santiago from Burgos to León (French Way). - To set the rental of this specific bicycle model the payment of a DEPOSIT of 100€ per bicycle is required, which you can purchase through our Online Shop in the "Bicycle rental" section, paying separately from the rental service. This DEPOSIT as indicated will be returned once we receive the bicycles and check the condition and good use of them. Without this necessary and mandatory payment of this deposit any order requesting the rent of one or more bicycles will be considered invalid.